Home → Blog → Guix on Android! Last year I thought to myself: since my phone is just a computer running an operating system called Android (or Replicant! ), and that Android is based on a Linux kernel, it's just another foreign distribution I could install GNU Guix on, right? It turned out it was absolutely the case. Today I was reminded on IRC of my attempt last year at installing GNU Guix on my phone. Hence this blog post. I'll try to give you all the knowledge and commands required to install it on your own Android device. During the boot process, the bootloader looks for the boot partition. It doesn't contain a filesystem, but only a gzipped cpio archive (the initramfs) and the kernel. The bootloader loads them in memory and the kernel starts using the initramfs. Then, the init system from this initramfs loads partitions in their respective directories: the system partition in /system, the vendor partition in /vendor and the data partition in /data. Other partitions may be loaded. And that's it. Android's root filesystem is actually the initramfs so any modification to its content will be lost after a reboot. Thankfully(? ), Android devices are typically not rebooted often. Another issue is the Android C library (libc), called Bionic: it has less functionality and works completely differently from the GNU libc. Since Guix is built with the Glibc, we will need to do something to make it work on our device. We will follow the binary installation guide. My hardware is aarch64, so I download the corresponding binary release. # Glibc needs these two files for networking. # to change nameservers if you use mobile data. Note that some devices may not have /system/etc available. In that case, /etc may be available. If none is available, create the directory by using adb shell to get a shell on your device, then push the files to that new directory. Now, we can't just copy the content of the binary archive to these folders because the initramfs has a limited amount of space. Guix complains when /gnu or /gnu/store is a symlink. One solution consists in installing the content of the binary tarball on an existing partition (because you can't modify the partition layout easily) that has enough free space, typically the data partition. Then this partition is mounted on /var and /gnu. Before that, you will need to find out what the data partition is in your system. Simply run mount | grep /data to see what partition was mounted. Finally, we need to create users and groups for Guix to work properly. Since Bionic doesn't use /etc/passwd or /etc/group to store the users, we need to create them from scratch. Note the addition of the root user and group, as well as the nobody user. 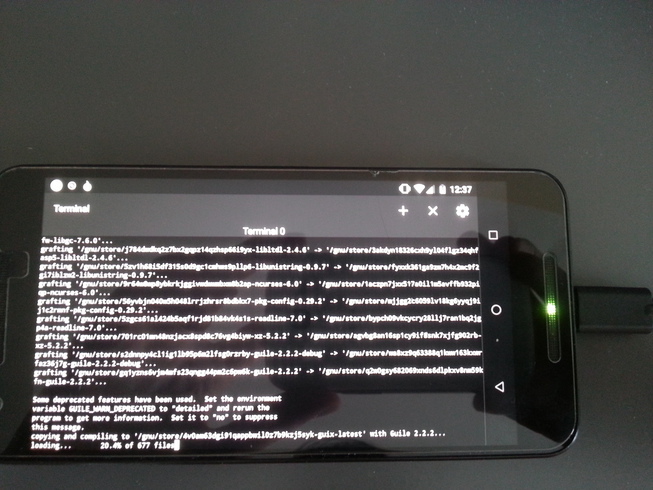 So, now we can enjoy the Guix package manager on Android! One of the drawbacks is that after a reboot we will have to redo half of the steps: recreate /var and /gnu, mount the partitions to them. Everytime you launch a shell, you will have to export the PATH to be able to run guix. You will have to run guix-daemon manually. To solve all of these problems at once, you should modify the boot image. That's tricky and I already put some effort to it, but the phone always ends up in a boot loop after I flash a modified boot image. The nice folks at #replicant suggested that I soldered some cable to access a serial console where debug messages may be dropped. Let's see how many fingers I burn before I can boot a custom boot image!